Multiple sources have told Al-Jazeera that ousted Egyptian leader Hosni Mubarak suffered a stroke and is on an artificial respirator, but that he is not "clinically dead," as previous reports had claimed. Reuters and the Associated Press also cite sources saying the deposed president is on life support. According to Al-Jazeera's Mike Hanna: "We do understand from family sources that Hosni Mubarak is improving. We believe he is still in a coma." 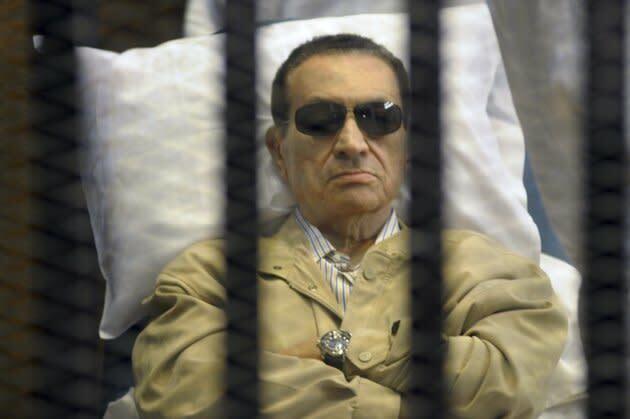 Earlier, the state-run news agency MENA reported that Mubarak had been declared clinically dead upon arriving at a military hospital on Tuesday evening. "Mubarak's heart stopped beating and was subjected to a defibrillator several times but did not respond," the MENA release stated. However, senior officials, including military leaders, have now contradicted that earlier report. Gen. Mamdouh Shahin, a member of the Supreme Council of the Armed Forces, reportedly told CNN that Mubarak "is not clinically dead as reported, but his health is deteriorating and he is in critical condition." Mubarak, 84, ruled Egypt for nearly 30 years, steering the nation through the turmoil that swept a Middle East buffeted by wars, terrorism and religious extremism. But the war hero and savior of his country became a criminal convicted for his role in the deaths of those fighting to oust him. Mubarak's health had been failing since he was sentenced to life in prison on June 2, after he was convicted of failing to prevent the killing of protesters in a February 2011 uprising against his rule. Doctors at the prison hospital used a defibrillator twice on June 11 after they could not find a pulse on the deposed leader. An AP story at the time said Mubarak "was slipping in and out of consciousness, was suffering from high blood pressure and breathing difficulties, and was in a deep depression, according to security officials at the prison." The son of a low-level bureaucrat in the Nile Delta, Mubarak completed Egypt's three-year military academy in two years and rose quickly through the ranks of the Egyptian air force, according to a 2011 profile in the Washington Post. He was tapped as Egypt's vice president in 1975 and thrust into the presidency at the age of 53 on Oct. 6, 1981, when Islamist radicals gunned down then President Anwar Sadat at a military parade. Mubarak himself survived six assassination attempts. He won four terms in single-candidate referendums and easily carried off the first contested election in 2005. During his presidency, Mubarak was a key U.S. ally in the Middle East, a stalwart against the West's Islamist enemies, even joining the 1999 invasion of Iraq. He was also able to rebuild relationships with neighboring countries that were strained after Sadat signed a peace treaty with Israel. Mubarak kept the peace with Israel while keeping Egypt free from Islamic militarism. On Nov. 17, 1997, an Islamic militant group killed 58 tourists and four Egyptians at an ancient temple near Luxor. Reuters called it the "most dramatic act in a 1990s rebellion by Islamists seeking to establish an Islamic state." The revolt was eventually crushed by state security. Mubarak valued stability above all else—and assumed the vast majority of Egyptians shared that perspective. Egypt was a nation, he would argue, that depended millenniums ago on central authority to organize the harvest and mobilize the resources to build the pyramids—and that still needed the same sort of unyielding management to avoid sectarian violence between Muslims and Christians or infiltration by terrorists. His relationship with the West also earned Egypt tens of billions of dollars in U.S. military and foreign aid over the course of his presidency. The money helped rebuild the country's crumbling infrastructure and invigorate its armed forces. However, his legacy was mixed. Efforts to groom his son Gamal as a successor ultimately stoked popular anger and suspicion that the spoils of government and economic growth would be steered to a favored clique for another generation, the Post reported. While the country's economy is much improved and the financial markets and infrastructure have been modernized, "the country still struggles with high unemployment, rampant corruption, residual state controls and growing demands for basic services from an ever-burgeoning population," the paper reported. Mubarak's political downfall began in January 2011 when anti-government protests began across Egypt, driven by discontent over poverty, repression and corruption. He ordered troops to quell the demonstrations. On Feb. 10, 2011, he transferred his power to Vice President Omar Suleiman. Mubarak refused to step down, however, igniting protests in Cairo's Tahrir Square. Mubarak stepped down the following day and a military council took control of the country. "This will be the land of my living and my death," Mubarak said in that final address as president. "It will remain a dear land to me. I will not leave it nor depart it until I am buried in the ground."